Track 4: "Yunda" was performed by Peter on Britain's Got Talent, Glasgow 2010. 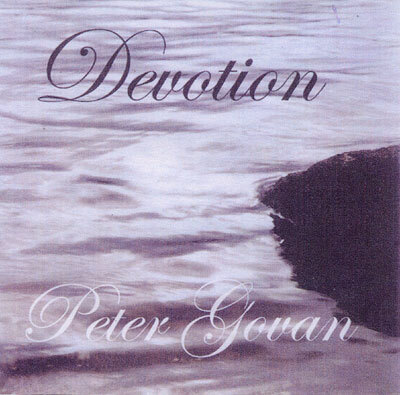 "Devotion" is a live recording of deeply relaxing and moving Harmonic Overtone melodies in which Peter's solo voice sings 3 seemingly endless vocal harmonics at the same time, in a highly resonant space accompanied with Indian Harmonium. Beautiful. "Devotion" is suitable for meditation, Yoga, massage and alternative healing environments. Peter Govan. BA (Hons) in Performance Arts, is an international Overtone Singing* Workshop facilitator, (*Two tone throat singing from Tuva) concert performer and composer of Overtone singing music blended with Scottish folk songs and Indian ragas. Peter also has 3 widely selling CD's to his name. Peter began teaching Overtone Singing workshops and giving concerts in 1997 but since 1990 he has worked locally with people with special needs encouraging self advocacy through music. Peter has also attended countless voice workshops, Voice conventions, choirs and African music workshops, giving him a wealth of wonderful voice experiences and the insight into running enlivening and heart opening workshops. Peter's teaching style is relaxed, open and fun with a dash of humour here and there, working mainly with Adults and sometimes children. Through gentle and attentive instruction Peter is able to create enough group trust, unity and intimacy to facilitate complete strangers to sing and work together like they have known each other for years! Peter continues to give magical Overtone concerts and workshops in the many countries to which he is warmly invited.